How to install and download Google Play store - it's easy! The Google Play Store gets frequent updates, which is great news. The not-so-great news is that it can take weeks, or for some people even longer, to get the latest iteration. The basic functionality never changes so being stuck on an older version isn’t all that bad. However, we understand the urge to get the latest and greatest version on your device. Looking to update Google Play Store on your device? Here’s how. The first thing you’ll want to do is see which version you have to make sure you’re downloading Google Play Store’s latest version. Scroll to the bottom. You’ll find the “Play Store version” there. This is important because you don’t want to install an older version of Google Play by accident. You also want to make sure you download a version that is compatible with your phone. That shouldn’t be too much of a problem unless you’re rocking some ancient version of Android like 2.3 Gingerbread — if that’s the case, it’s probably time to replace your phone! Head to this link by clicking here. Find the version of the Play Store you want. If you want a newer version, reference your current version and see if a new one is available. Download the app by following the website’s instructions. There are some other places that have recent Play Store APKs uploaded. However, APKMirror is just easiest method and it’s one that people generally trust. You shouldn’t have problems getting it from there. This is how APK installations look on Android Oreo and higher. The Unknown Sources setting has been a part of Android for ages. When disabled, it prevents users (and other apps) from installing applications from anywhere aside from the Google Play Store. Android Oreo changed this to a per-app permission rather than a system setting. Thus, there are two different parts to this one. Find the Unknown Sources option and check the box. A warning will pop up which you should definitely read. Once done, hit “OK” and this will enable you to install APKs from Unknown Sources. Begin installation with a file browser or through the web browser. Android will tell you that the app doesn’t have permission to install APKs. Click the available Settings button in that prompt. In the next menu, tick the box that lets that app install APKs. Hit the back button to return to your installation. 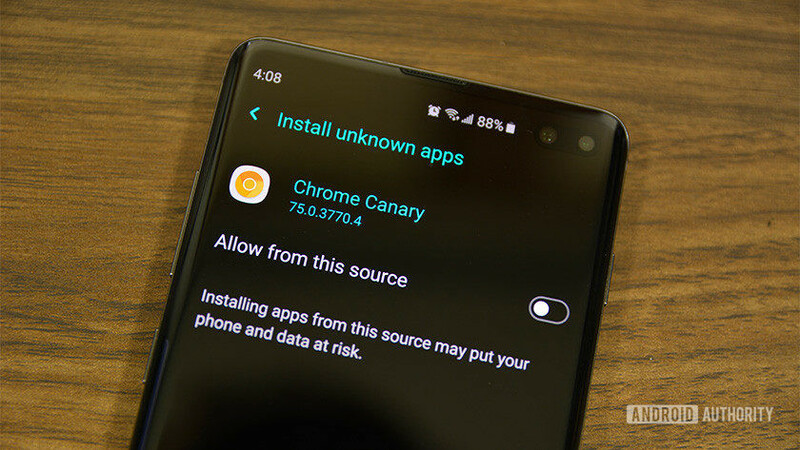 It’s a little more complicated, but the trade off is better security because the only app that can install third party APKs is the one you just gave permission to as opposed to the system-wide setting in previous versions of Android. Now that we’re all set to go it’s time to install this thing. Use your favorite file browser. For those who may not have one, you can see our recommendations here! Open your file browser and navigate to wherever you downloaded the Google Play Store APK. If you downloaded it on your device then it will be on your SD card in the Downloads folder. Hey you did it! Wait, there is still one more step! Leaving the Unknown Sources box checked is a major security hole that can cause problems down the road. The best way to keep yourself safe is to go back and turn that off! If you have Android Oreo or later, you are done and you can skip this step because these settings aren’t in your phone anymore. There’s probably a reason they changed it in Android Oreo and this is probably it. 5 best third party app stores for Android and other options too! You now know how to download Google Play Store to ensure you have the latest version. This method will work on almost any Android device, but there may be slight variances depending on your Android version and OEM. Do keep in mind that this will not work on Amazon Kindle Fire devices. That’s an entirely different process which may also require you to root your device.